Peel the squash, remove the seeds and cut into bite size pieces. Peel the apples, remove the core and cut into bite size pieces. 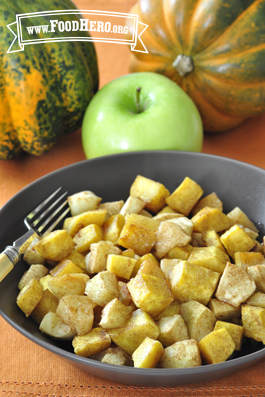 Combine the squash and apple pieces, oil, cinnamon, sugar and salt together in a bowl. Toss to coat evenly. Spread the mixture on a metal baking pan. Bake in a 425 degree oven for 20 to 30 minutes, or until squash is soft. Recipe adapted from Nutrition Matters.